The websites creator or author is IWorX Ltd. Greece, http://www.iworx.gr. The web server with the IP-address 139.91.151.163 used by Cidoc-crm.org is run by Foundation of research and Technology Hellas and is located in Greece. The server runs exclusively the website Cidoc-crm.org. 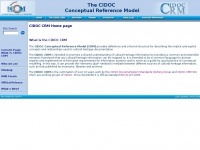 A Apache server hosts the websites of Cidoc-crm.org. The website does not specify details about the inclusion of its content in search engines. For this reason the content will be included by search engines.